Bookkeeping and accounting is the act of tracking and analyzing the financial activity for your business, including purchases, sales to customers and supplier payments. Many business owners outsource their bookkeeping and accounting while others do it in house. Regardless, it’s important to properly set up and understand your small business bookkeeping, accounting, and taxes. Regardless of whether you hire someone to do your bookkeeping or not, you need to have a good bookkeeping system in place. We therefore recommend that you try QuickBooks, which will help you with all of your bookkeeping, accounting, and tax needs. You can take it for a test drive by signing up for a free 30-day trial, no strings. In this section, we will provide the framework for understanding each of these things and later in the guide, we’ll show you how to track them in detail. The primary difference between the two is based on when you receive payment from your customer. For example, let’s say a customer comes into your store to purchase a pair of jeans. The customer pays you for the jeans and leaves the store. This is considered a cash sale because both the sale and the payment occurred at the same time, regardless of whether the customer paid with cash, credit card, or debit card. A credit sale is one where some time passes between when you make the sale and when you receive payment from your customer. This is called a credit sale because you have made a sale “on credit” to your customer, anticipating that they will pay you at a later date. For example, let’s say a therapist had a 1-hour session with a customer and will send them a bill for the session. The therapist has provided the services and expects to be paid within the payment terms they have extended to their customer. This is where you need a good bookkeeping system in place to help you track how much your customers owe you and when it is due. We’ll show you how to track all of this later in this guide. For recurring expenses like utilities and rent, you might have those payments automatically deducted from your bank account each month. Then, there are unexpected expenses – like repairs on a car that you use for business – that you may pay for those with a check or debit card. This is also where you need to have a good system in place to help you keep track of how much you owe to your vendors and suppliers (accounts payable) and when payment is due. Different vendors may extend different payment terms, and a bookkeeping system keeps you organized. If you sell products, then you want to make sure that you keep track of your inventory purchases, cost, and quantities. In general, you should create a purchase order and send it to your supplier when placing orders. Once you receive the product at your warehouse, it should be verified. Once you have verified all product was received, then you can enter the bill you received from your supplier and pay for the goods before the due date. Be sure to check out how to set up & track inventory in QuickBooks Online to see how easy it is to manage your inventory in QuickBooks. Liabilities are not expenses. The primary difference between the two is if you were to go out of business tomorrow, you would no longer have to pay expenses. You would stop making payments for utilities and you would lay off your employees and no longer have payroll expenses. However, liabilities are outstanding balances that you owe, regardless of whether or not you are in business. For example, if you have a business loan that your bank extended to you, then you would still owe the bank that money until you pay off the loan. One of the first things you will do when setting up your bookkeeping system is to create a chart of accounts list. The chart of accounts is the backbone of your bookkeeping/accounting system. We will discuss the importance of the chart of accounts and how to properly set one up in the next section. The chart of accounts is a list of accounts used to categorize every financial transaction that your business generates. For example, you could have an account called “Consulting Income,” which would be used to record all of your income from consulting services that you provide. Another example would be a rent expense account that you would use to track rent payments that you make for your office space. 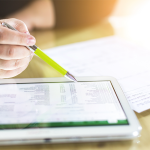 By setting up the chart of accounts, QuickBooks will automatically do the accounting (debits and credits) in the background so that you don’t have to. I like to illustrate the chart of accounts using a 5 drawer filing cabinet. Each drawer represents an account type. Assets – Assets are items that your business has in its possession. For example, money that you have in your bank account or inventory that you have on-hand are assets. Liabilities – This is the money that your business owes to others. For example, an auto loan on a car you use for business, a mortgage that you have for your warehouse, or sales tax that you have collected from your customers (due to the state) are all liabilities. Owner’s Equity – Equity is everything your business owns. For example, any money that an owner invests in their business is considered equity. Income – Income is the proceeds from the sale of products or services. For example, plumbing services sold or the sale of 5 lamps to a customer is income. Expenses – Expenses are items that you pay to run day to day business operations. For example, advertising expenses, office supplies, and payroll are all expenses. Each account that we create are virtual “folders” that will fit into one of these 5 drawers. Below you will find a brief description of these account types along with some examples of the accounts that belong in each. By setting these accounts up correctly, all of your income and expense accounts should appear on the Profit and Loss statement and the assets, liabilities and owner’s equity accounts should appear on the Balance Sheet. If you don’t take the time to properly set up the chart of accounts (the backbone of the system), you will end up with inaccurate and unreliable financial statements. If you are unsure about when to set up an account or how to set one up, most accounting software programs like QuickBooks Online will come with a preset list of accounts that you can modify as needed. Based on your industry, QuickBooks will create a chart of accounts list for you and you can just add any additional accounts you might need. Once you set up your chart of accounts in QuickBooks, you can easily connect your business checking account and your credit card accounts to QuickBooks so that your transactions will automatically download for you into the right accounts. Only set up accounts that you need and no more. While it might sound like a great idea to set up a bunch of accounts, it’s just going to frustrate you when you start managing your transactions and you have to scroll through a long list before you can get to the account that you need. A good rule of thumb is if you need the ability to keep an eye on a particular expense, then setting up a separate account can be good because you can run a report in about 30 seconds in QuickBooks Online to get the info that you need. For example, if you want to keep an eye on how much you spend in bank charges like ATM fees or NSF fees, then you should set up separate accounts to keep track of these. By setting up the account this way, you can keep track of office supplies not only purchased at Staples but other places like Office Depot or Target. 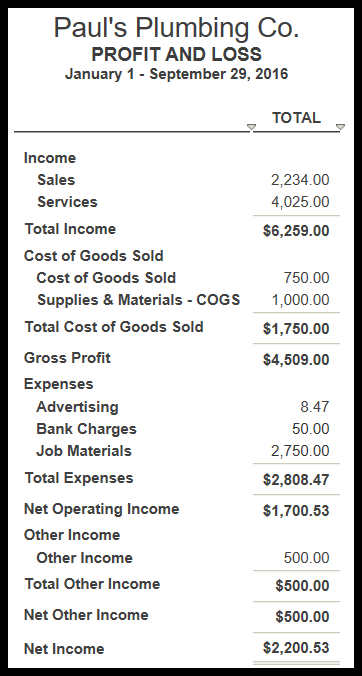 If you want to know how much you have spent with a vendor like Staples, then you should set Staples up as a vendor and run a report to see what your expenses are at Staples. 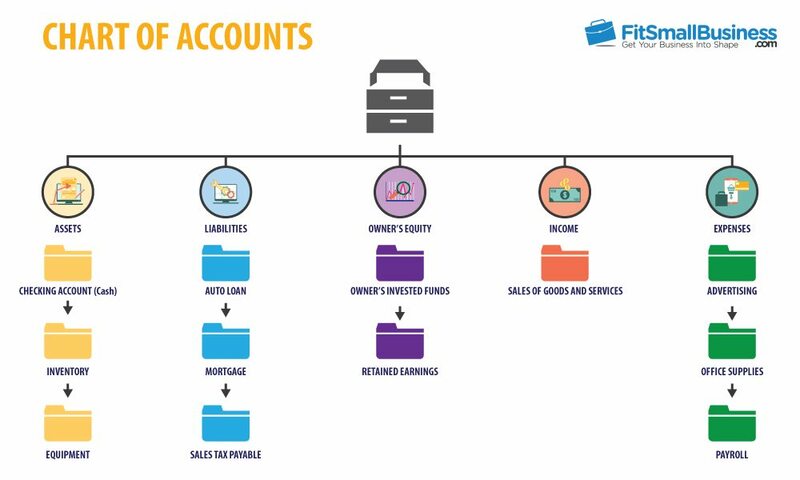 If you recall, each drawer in our filing cabinet example represents one of the five account types: Income, Expenses, Assets, Liabilities, Owner’s Equity. It is very important that you use the correct account type when adding a new account to your chart of accounts list. As discussed, the account type determines which financial statement the account will appear on (Profit and Loss Statement or Balance Sheet). If you set up an account and you use the wrong account type then this will result in inaccurate financial statements. However, the great thing about QuickBooks Online is when you set up a new account, the program has examples and other great tips in the setup window to help you choose the right account. Having a solid chart of accounts will ensure that all of your income and expenses are categorized appropriately. In addition, QuickBooks will automatically categorize transactions based on what you have done in the past. Once you set up your chart of accounts based on the steps we have outlined above, you will be able to get the pulse of your business by periodically generating and reviewing financial statements. The Profit & Loss Statement provides a summary of your revenue minus expenses for a specific period of time, such as a month, a quarter, or a year. It provides your bottom line net profit (positive #) or net loss (negative #). It is important for you to know whether or not you are making money or losing money. By reviewing the Profit and Loss Statement, you will gain insight into how much revenue you have generated for all of the products and services that you sell. It will also show you where your money is going in terms of expenses. If you review this report monthly and look at each month side by side, you will begin to notice trends that can help you to make decisions about your business. For example, let’s say that you are looking at your March profit and loss statement and your supplies expense account is $10,000. However, it was $4,000 and $5,000 respectively for the month of January and February. Most of the time you will be aware of significant fluctuations like this and there might be a perfectly good explanation for why this expense doubled for the month of March. However, this is the kind of thing that you want to look into right away. The Balance Sheet includes the assets, liabilities, and owner’s equity for your business. Assets are tangible and intangible items owned by the company. For example, when you purchase an iPad, equipment, or inventory, you will classify those purchases as assets. Liabilities are what you owe to others. For example, the credit cards that you use to make purchases for your business is money that you owe to the credit card companies and will be classified as liabilities. Owner’s equity reflects the net amount of money that the owner or other investors have invested in the business, as well as money retained from profits (retained earnings). Operating Activities – This section shows how much cash was generated from operations which make up the day-to-day running of the business. For example, cash generated from the sale of products and services would be considered operating activities. Investing Activities – This section shows how much cash was generated from assets purchased for the business. For example, let’s say you purchased a truck to use in your business. Regardless of whether the transaction was paid in cash or financed, it would appear under investing activities. In addition, any portion that was financed will also appear under financing activities. Financing – This section reflects the cash that has come in or gone out of the company for the purpose of financing all of the other business activities. For example, any funds invested in the business by the owner would appear in this section. Also, if you took out a loan to finance the truck that you purchased then that loan would also be categorized in this section. An accounting period can be a month, a quarter, or a year. At the end of every accounting period, there are bookkeeping tasks that need to be completed to put a bow on the current period before starting the new one. In general, most small businesses tend to complete these tasks sometime during the 1st quarter of the year (January – March) to prepare for tax time. I would like to recommend that you get into a habit of completing these tasks on a monthly basis. I promise you that you won’t regret it and may even look forward to filing your taxes. As I have mentioned throughout this article, if you use QuickBooks to manage your accounting, then it makes a lot of these tasks much simpler to do. Reconciling is the process of making sure that your bank and credit card statements match what you have recorded in your bookkeeping system. If you take the time to reconcile your accounts then you will ensure that all income and expenses will be included on your financial statements. At the end of an accounting period, certain accounts need to be closed while others remain open. While you can close your books on a monthly or quarterly basis, most small businesses close their books at the end of the year (Dec 31) to prepare for taxes. In general, income and expense accounts are zeroed out (closed) at the end of the accounting period so that they start with a zero balance at the beginning of the new accounting period (Jan 1). If you use QuickBooks, it will automatically close your income and expense accounts for you. However, if you don’t use QuickBooks, you will need to record a journal entry to close these accounts. A journal entry is a manual way to record business transactions. It generally will include an effective date, a debit amount, and a credit amount. To learn more about what a journal entry is and how to create one, check this out. Balance sheet accounts are not closed at the end of an accounting period. Instead, the balance at the end of the old accounting period is carried over to the new accounting period. For example, your bank account is a balance sheet account. The ending balance in your bank account at Dec 31 becomes the beginning balance of the new accounting period, Jan 1. To protect your QuickBooks data, you should set a closing date and password. This will prevent any changes from being made to your data but allow you to continue entering data into QuickBooks for the new accounting period. If you use the accrual basis of accounting, then you want to make sure that all income and expenses that have been incurred have been recorded. The accrual basis of accounting means that you recognize income as soon as you have provided the product or service to your customer, regardless of when payment is received. By the same token, expenses are recognized as soon as you received the product or service that you purchased, regardless of when you pay your vendor or supplier. To learn more about the accrual vs. cash basis of accounting, check out our guide on cash and accrual methods. For example, if you made purchases in December and you have not paid for them yet, you want to make sure that you create a journal entry to record those expenses so that you don’t miss out on deducting them, which can reduce your tax liability. Retained earnings are profits from earlier accounting periods that have not been distributed to the company’s owners. At the end of your fiscal year, QuickBooks computes your profit (or loss) into Retained Earnings. To distribute profits to the owner, you need to create a journal entry to an equity account called Owner’s Draw or Distributions and offset it to the Retained earnings. Make sure that you have added all fixed asset purchases like date of purchase, purchase price, type of asset, make, model, and year in QuickBooks. You will need this information to compute your depreciation expense for these items. Fixed assets are generally expensed over their useful life as opposed to all in the year of purchase. However, if you started your business this year, you may be eligible to write off 100% of new equipment purchases using the Section 179 election. To find out if you qualify, check out Business Tax Saving Tips. Depreciation is when you spread the cost of fixed assets that you purchase for your business, like furniture or computers, over the number of years the asset is expected to last. Depreciation can be used for tax and accounting purposes. Each fixed asset should have its own “parent” asset account in the chart of accounts, and two sub accounts: one for the original purchase price of the item, and the other for its accumulated depreciation. For example, you could have a “Company Vehicle” parent account with two subaccounts, “Purchase” and “Depreciation.” You will also need a separate expense account to track all depreciation expenses, and you will need to record depreciation using a journal entry. If you use QuickBooks, this is pretty easy to do. To learn more about depreciation, check out our article on What depreciation is and how it works. To ensure that the inventory that you have on the shelf matches with what your records show, you must take a physical inventory count at least once a year. If you use QuickBooks, you can print an inventory count sheet so that you can easily record your physical counts. If you have a discrepancy between what’s on the shelf and what’ on the books, you will need to record an inventory adjustment to match what you have on the shelf. Inventory adjustments can easily be done in QuickBooks. If you don’t use QuickBooks Online to manage your books, then you need to be sure to backup your accounting data to a location that is not on your computer. For example, you can download and save your file to a secure cloud storage like Dropbox or OneDrive. As mentioned in the What Is The Best Way to Keep It Organized section, be sure all of your supporting documents have been saved to a secure cloud storage location. One of the major pain points with bookkeeping and accounting is the amount of paperwork you have to manage. In fact, this simple fact causes many people to shy away from fully embracing and learning the small business bookkeeping and accounting process. To help, we have information on the right paperwork to know and understand. You must do a good job of keeping documents that support all of your business transactions. Having supporting documents is important for a couple of reasons. If you receive that dreaded letter from the IRS to audit your books, you will need to be able to show documents that support your tax deductions. On a more pleasant note, if you have a potential investor or lender, they will want to review your financial statements and they could ask you for supporting documents to verify that your financial statements are accurate. Keep bank statements for all of your business accounts. This includes checking, savings and money market accounts. Keep credit card statements for all of your business accounts. Keep copies of all canceled checks. Most banks provide electronic copies of canceled checks that you can download as PDF documents. I recommend you keep an electronic or scanned copy of your check since the ink will eventually fade. Keep receipts for all purchases that you make. Similar to canceled checks, I recommend that you scan a copy onto your computer since the ink will fade and make it illegible. Keep copies of all paid vendor bills. If you have QuickBooks, attach a copy of the vendor bill to the bill transaction you created in QuickBooks. Keep copies of all paid customer invoices. If you use QuickBooks to manage your books, then be sure to save a backup copy of your file so you can go back to customer invoices. Keep copies of all checks received from customers and credit card payment slips. If you use QuickBooks, I recommend that you scan a copy of the customer’s check to QuickBooks & attach it to the paid invoice. Keep copies of all sale receipts. If you use QuickBooks, just be sure to backup your QuickBooks file so that you can access your sales receipts when you need to. Keep a copy of all deposit slips. I recommend that you scan a copy to your computer since the ink will eventually fade. If you use a cash register, keep your cash register tapes. If possible, try and record your sales totals in a POS system or use QuickBooks. You will need to have an electronic record of your sales since the ink will eventually fade on the cash register tapes. 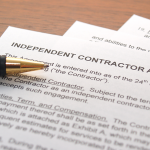 If you provide more than $600 of services to a client as an independent contractor, then you will most likely receive a 1099-MISC form. Be sure to scan these into QuickBooks and attach them to your customer’s invoice or sales receipt. Keep copies of all tax returns filed, including all supporting schedules and documents to support deductions taken. If you have a CPA that prepares your tax return they should send you a complete tax return package for your records. Scan all forms and supporting schedules onto your computer and keep on file. Setting up an organized system that is easy to maintain can be challenging. I will share with you what I have done to keep things straight. The benefits of being organized are enormous. Everything seems more manageable and less overwhelming once you have a system in place. In general, you should be able to implement this system for any type of business with a few tweaks. When it comes to paperwork, my motto is “paperless.” I do not recommend that you surround yourself with filing cabinets filled with paper. If this is your current situation, make a New Year’s resolution to go paperless for the new year. Cloud storage is usually FREE of charge. Cloud storage generally includes at least 1 GB of storage space, which allows you to store thousands of documents. There is no backup required. Once you save something to the cloud, it is safe and secure. If you must print something, shred it once you’re done with the document – don’t keep it. To minimize the amount of paper coming your way, take the time to contact your bank and credit card companies and ask them to stop sending you paper statements. Most of these companies do a pretty good job asking their customers to go green so that they can reduce their postage costs. When you get ready to reconcile your bank account or credit card account in QuickBooks, just save your bank and credit card statements to your cloud storage account. If you use QuickBooks Online, you can attach documents to any transactions that you create in QuickBooks. For example, you can scan a customer’s check onto your computer and attach it to the invoice that was paid. Once you have scanned a legible copy of your documents and saved them to an offsite storage location or the cloud, feel free to shred the original paper document. The IRS does not require you to keep the original document as long as you have an electronic copy. Last but not least, I want to share with you a way to easily organize your “electronic” filing cabinet. You can set up this system easily on your secure cloud storage. You should have everything separated by year. So the first folder you should create is the year folder (2016). Then I would set up subfolders for Bank Statements, Credit Card Statements, Customers, Employees Lines of Credit, Loans, and Vendors as I have done below. Within each folder, you may need to create additional subfolders. For example, if you have more than one bank account, then you should set up one folder for each bank account and save all 12 bank statements (one for each month) in their respective folders. 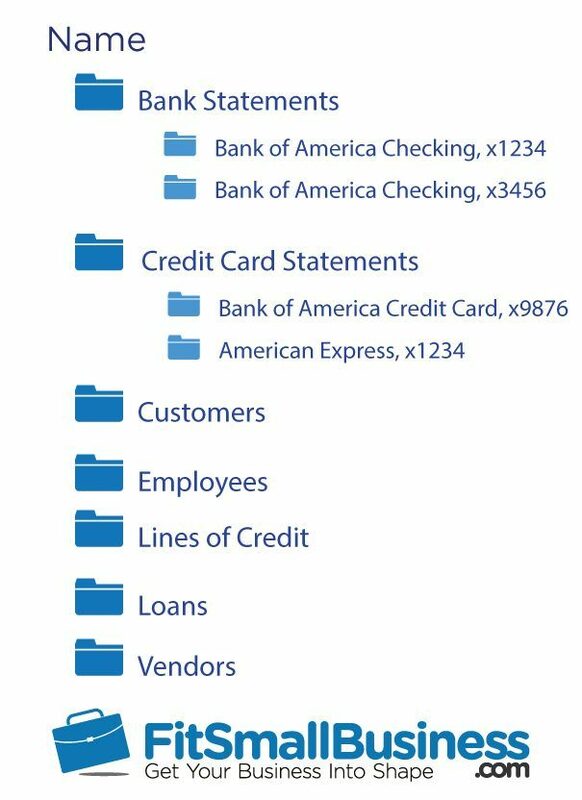 For Customers, Vendors, and Employees, you could go with one subfolder for each customer, vendor, and employee or you could go with subfolders that combine documents for all. For example, you could set up a subfolder under Employees called W4 forms. In this folder, you could scan all employee W4 forms to keep them on file. A good rule of thumb is to keep everything for a minimum of 3 years and most likely it’s safe to toss after 7 years. For tax purposes, if you file a fraudulent return or you don’t file your taxes at all, then there is no statute of limitations on how far back the IRS can ask you to provide documentation for. Keeping up with the taxes that you are subject to as a business owner can be overwhelming. However, it does not have to be. If you have an organized bookkeeping system, it makes tax time a breeze. In this section we will discuss the taxes that you may be required to pay, the tax forms you are required to file, and when payment is due. I will also provide you with some great resources that you can refer to for help. Finally, I recommend that you speak with a tax professional that can provide you with guidance for your specific situation. If you do your own taxes, consider using TurboTax. It is our recommended tax software for small businesses and makes it a breeze to file your taxes. In this guide, we focus primarily on your federal tax obligations. However, there are many state and local tax requirements for all business entities. To learn more about state tax requirements, check this out. The taxes that your business is subject to is tied to the type of business structure your business is set up as. There are 4 main types of business structures that we will briefly discuss here: Sole proprietorship, Partnership, LLC, Corporation. A business that has one owner is considered to be a sole proprietor. Most new businesses start out as sole proprietors and then eventually grow by adding new partners and staff. Sole proprietors are not considered to be separate legal entities like corporations are so they are not taxed as such. Income tax on all business earnings Schedule C, Profit or Loss from a business. This form should be filed along with your personal 1040 tax return. If you’re doing your own taxes check out how to complete Schedule C.
Self-Employment tax (This is the employer & employee portion of Social Security and Medicare tax for yourself.) Schedule SE, Self-Employment Tax. This form should be filed along with your personal 1040 tax return. To learn more about rates, who has to pay and how to lower your tax bill, be sure to head over to our Self Employment tax guide. If your business is set up as a partnership (this generally means that you have more than one owner), the income earned by the partnerships is split up among the partners and reported on their personal tax returns as income. Be sure to check out our guide on how to complete Form 1065 for Partnerships. An LLC is a business structure allowed by each state that gives business owners more protection from the business’ lawsuits and debts. Each state my use different regulations so you need to check with the state that you’re in to see what the requirements are. An S-Corp functions like a partnership but gives the owners more legal protection from lawsuits than partnerships do. Check out our S Corp Tax Guide to learn the ins and outs of this type of corporation. A C-corporation is considered a separate legal entity for tax purposes. The biggest disadvantage of having your business structured as a C-corp is that profits are taxed twice. The Corporation is taxed on any profit that the business makes, and the stockholders are taxed on any dividends they received. If you’re the owner of a C-corp, then you could be taxed twice. However, you can pay yourself a salary, which will reduce the earnings of the corporation. If you sell products then you should be collecting sales tax from your customers. Sales tax rates vary by county and city. If you sell products in multiple locations then you have to keep track of all of the taxes collected and pay those taxes to the appropriate government entity when they are due. QuickBooks allows you to easily track sales tax collected by county and city. Check out our Sales & Use Tax Guide to learn more. Before you start selling products and collecting sales tax in any state, you must file an application to collect and report sales tax in each state that you plan to do so. To learn more about state and local tax requirements, check out the Federation of Tax Administrators. If you have employees, you are required to make payroll tax deposits and file payroll tax forms to meet both federal and state requirements. There are also other payroll requirements such as gathering I-9 forms and adhering to labor laws. Sign up for QuickBooks Payroll and easily set up and run payroll in just a few steps. While it is impossible to cover everything in one guide, I hope that we did provide you with a better understanding of the importance of establishing a good bookkeeping system, the benefits of using accounting software like QuickBooks to prevent you from doing manual tasks, and understanding the taxes your business could be subject to. Small business bookkeeping is one of those areas where if you invest the time upfront the rewards will pay off in the long run. As we have discussed, whether you plan to do your own books or hire a bookkeeper, you need to have a good small business bookkeeping system like QuickBooks in place that you understand. To learn how to use QuickBooks, check out our free course. The best way to get up to speed quickly is to set up an account to get that hands on experience; so don’t forget to sign up for your free 30-day trial of QuickBooks. I have read your blog very carefully. The information you provide is very helpful. I also provide same services. You secured this altogether. The illustrations indicating what an asset report and P&L should look like are exceptionally useful, alongside the diagram for how to set up the graph of records. Thanks for this useful info. Thanks for the positive feedback Jonny! Hi Whitney, thanks for the positive feedback and for sharing this info with our readers! You covered this quite thoroughly. 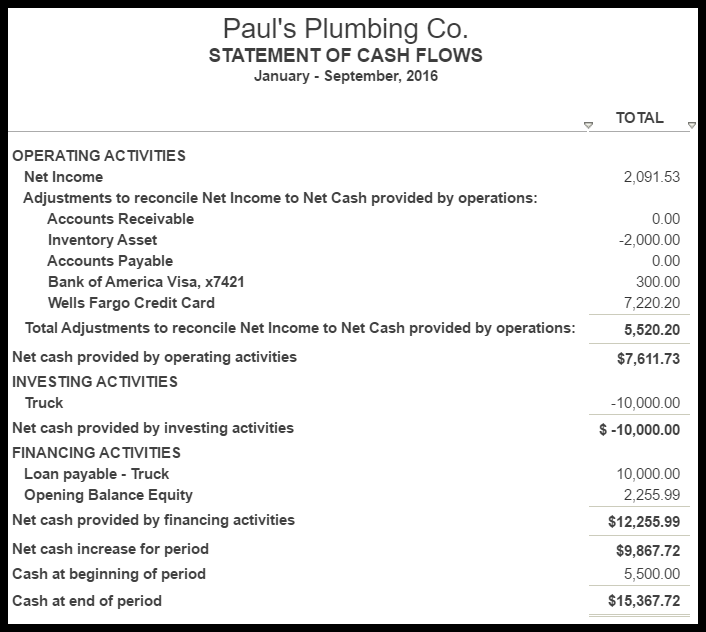 The graphics showing what a balance sheet and P&L should look like are very helpful, along with the chart for how to set up the chart of accounts. I like how you covered from beginning to end – how to set everything up, and then how to close the books at the end of the year. Very nicely done, thank you! Thanks Jeff, appreciate the positive feedback!